I knew I didn’t want it, the moment I saw it. When I walked through Center #2’s door this morning, the director gave me a big smile and began digging through the box of envelopes as I went to drop my two youngest in their respective rooms. I tried to sneak out the back door, but couldn’t figure out the child locks – since I’d already dropped off my four year old and therefore had nobody available to help me figure them out, I had no choice but to give up and go back through the main door. And her box of envelopes. One of which was handed to me. I’ve known it was coming for weeks. I had eavesdropped shamelessly while pretending to mix up a cup of complimentary coffee happened to overhear part of the discussions between the director and her assistant. And these things tend to go in waves: if one center raises rates, the others are sure to follow. And it’s almost approaching the months before Fall, the traditional time of year for such things. The envelope sat on the seat next to me all the way home humming ‘neener-neener-neener, I’m a raaaaaate increeeeease and there’s nothin’ you can dooooo about iiiiiit’. I’ve been ignoring the envelope for several hours now. I’ve gotten a few projects out the door. Fixed a broken stored procedure, updated a mis-targeted URL, figured out why I was getting 4,000 rows when obviously there shouldn’t be more than, say, twelve, and checked my email. Twice. Responded at great and unnecessary length (that ought to teach ‘em not to ask dumb questions!). Started a load of laundry. Reorganized my task list. Discussed solar panels with my husband, to include how much rebate we’d get from the glorious and power-deprived state for them, and how much heat each air conditioning unit was adding to the overall mess. All of which has nothing to do with the topic of the day. Which is that finally, inevitably, I gave in and opened the envelope. The best I can say about it is that overall, as increases go, it wasn’t all that bad. A mere 6%, $25 a week for the two kids. I’ve had worse. I think I’m becoming numb to such things. Or maybe it’s just the heat giving me a big old case of Couldn’t Give A Tinker’s Cuss. But I looked at this increase and just had to shrug. I suspect the envelope feels a little let down by my lack of outrage. And yet that too, is what it is. I can’t feel the least bit sorry for the envelope and how let down it may be by my lack of outrage. It’s like trying to drum up enthusiasm about finishing the socks for Danger Mouse. She chose the yarn out of the box. She’s been pestering me to finish them for over a week now. She has worn the one finished sock for an entire day while asking, repeatedly, if the other one was finished yet. I am getting nine stitches and 11.25 rows to the inch, here. 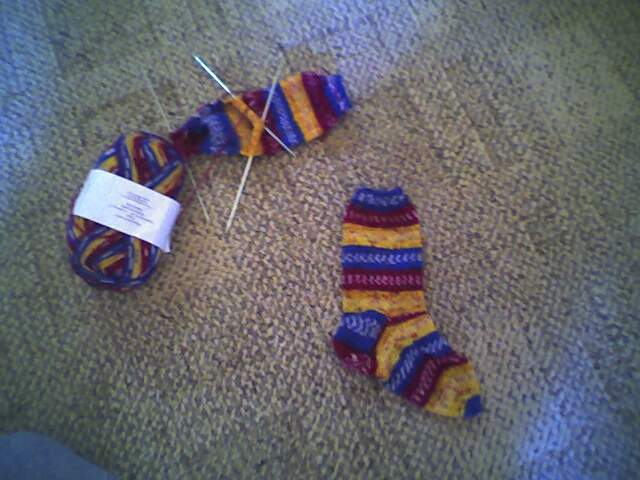 I have six inches of instep / toe to go. Which is a lot. Speaking of which: These are wool socks. Quick temperature check: it was 115 out here yesterday. The crazy child will want to wear these socks to school the instant they are done. Which is going to mean that she is going to take them off, because it is too hot to wear wool socks to school. Which is going to mean that one or both of them will promptly get lost. Which makes it even harder for me to drum up the enthusiasm to finish knitting them. Even if they are kinda cute. See? And inexpensive, too. One ball of Simple Stripes 'Crayon' from KnitPicks for two Little Girl Sized Socks, $2.99. I like how they make it not seem so bad by telling you how much more it is per week. As if they didn't require you to pay by the month and give them Godknowshowmuch notice and heaven forbid you take a day off. You have my simpathy about the heat/air-con, although I'm also jealous that you've got some (I WISH I could justify it, but not in our usual 3-week summer). Oh, and remind me when I start talking about buying another car - this one MUST have air-conditioning! If I was god, I'd ban humidity. That's what's making my life hell at the moment. I'm just outside of Washington DC, and I can't wrap my brain around the concept of a house with no AC whatsoever. The summers here start in early June and last through September. Typical July days are in the low 90s, with about 70% humidity. The air outside is thick, hot, and damp, and very very still. The insects love it - they sing all day. The heavy humidity is wonderful for plant life, so everything here is lush and green. So it's nice to sit in my air-conditioned sunroom and look out into the woods. Without AC, I think my house would disintegrate in about a week.